So, what do you know? You’re finally the bride. All this time of wishing and hoping and catching bouquets, and now, the spotlight is on you. You certainly have the man, and you probably have a dress in mind, but where will this once and lifetime ceremony take place? Maybe your friends and family have made suggestions, but your vision is different from theirs. Maybe they’re insisting you go for something small and quaint, but you want ornamented and over-the-top. It is your sacred day, after all. Whether you have deep pockets and are looking to rent one of the globe’s poshest locations on the map or you have champagne taste on a beer budget and want to simply glean some ideas to implement into your wedding festivities to give it an extra luxurious feel for half the price. 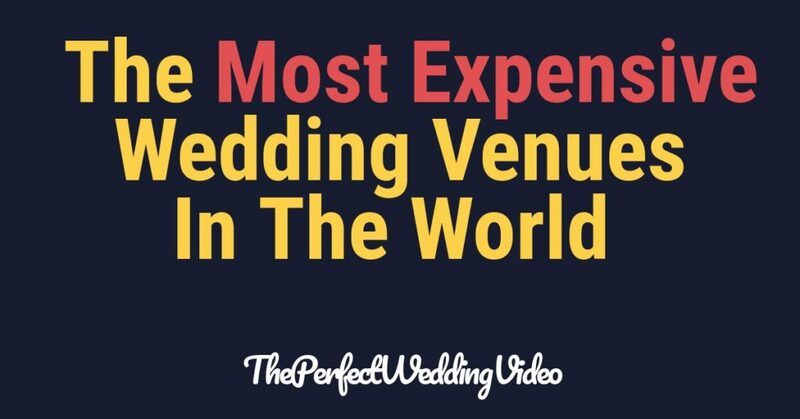 You’ll enjoy this list of the most expensive—and super extravagant—wedding venues in the world. The—down-to-earth yet otherworldly—MolenVliet Wine Estates in the Banhoek Valley has grown in popularity over the years, bringing smiles to many couples’ faces. First of all, it’s situated right in the heart of wine country, giving its attendees a bucolically cinematic view of aged mountain ranges. If you want to make an impression in your wedding scrapbook, The MolenVliet Wine Estates could be the perfect choice. Your photos and wedding film will exude a sumptuously rustic mien. The captivating beauty of the exotic vineyards is enough to set the mood and bring about pure and utter splendor. If not, the gardens should do the trick; they are meticulously landscaped and boast of floral mystique. Price Point: The most cost-effective option they have begins at £7,514.95 for a maximum of 14 guests. As always, prices are subject to change. Quite frankly, the name says it all. The One & Only Reethi Rah Resort is truly the one and only site in the Maldives that stuns the way it does and couples as a wedding venue. Perhaps you want a quiet, charming dining experience complete with lively music while partaking in an azure sky and seas. Well, this endearing little spot near the Indian Ocean could be what you’ve been desiring. Thatch-roofing spans all 128 of its chic lodges. The One & Only Reethi Rah Resort works especially well for those who love amenities and indoor recreation, those who don’t mind leaving athleticism behind for the weekend. The lodges or villas come with a bunch of perks: terraces, private jacuzzis and pools. But, that’s not all. Get ready for the saunas, outdoor pools and built-in restaurants known for flavourful food. Why not have your hammock and your canopy bed, too? Price Point: The most cost-effective option they have will run you about £5,263.31 nightly. The Laucala Island Resort is in a class of its own. In fact, it’s beyond next level. It’s understandably secluded, and you’d be better be glad it is. If it weren’t, everyone nearby would crash your wedding. I mean, with a site this gorgeous, who could resist? 25 well-built villas comprise the resort, compassing the northern coastline. You’ll be proffered a variety of hardwearing boats to set sail in with your lucky guests, not to mention the scenic beaches covered in rich, white sand. And, if that’s not remarkable enough for you, I bet the striking rainforests and coral reefs are. What’s more, it’s not all aesthetics. There is hands-on fun just waiting to be had. Watersports, such as scuba diving or jet-skiing is ideal. You could always tone it down, as well, and opt for kayaking at sunset. Furthermore, if you’re (secretly) a competitive person in your everyday life, on social media or amongst your associates, this breathtaking paradise will give you the win, hands down. Tell me. How can the Laucala Island Resort be topped? Oh, and there are Fijian spas and volcanoes…enough said. Price Point: One of the most cost-effective options they have begins at about £112,780.15 for a maximum of 80 guests. As always, prices are subject to change. Reminiscent of the Augarten Wien and the Reggia di Caserta, this enchanting palace will warm your heart. Chateaux Vaux-le-Vicomte in Maincy, France is fancy-schmancy from the frontside to the back. It’s a historical property surrounded by 1,200 acres of handsomely trimmed parkland. You can rent it out in five-hour blocks. You have the choice of tying the knot outdoors or indoors in one of the gargantuan ballrooms. Fortunately, you can access the garden view from inside of the chateaux if you want the best of both worlds. Price Point: If you have £45,105.32 and a minimum of 50 guests, go for it. As always, prices are subject to change. The Odescalchi Castle in Rome doesn’t need an introduction. It’s been fit for a host of celebrity weddings, so why not yours? This labyrinth-style venue offers lavish adornment, lots of pretty flowers, dreamy lighting and more than one setting. The Secret Garden, for example, is available to those who prefer open-air functions. If an alfresco event isn’t your thing, The Hall of the Caesars, a 15th century tower, is also accessible. It’s a bit more “princess-knights-and-dragons” though. The Odescalchi Castle can hold up to 1,000 people. Price Point: £37,593.70 should cover your entire wedding party, however, prices increase based on how many invitees are present.